I just pray that His Holiness or a future pope tells bishops to tell their pro-choice Catholics be they politicians or not, to stop receiving Holy Communion until they repent and go to confession and worthily receive absolution and do their penance! Pope Francis thanked Italy’s Pro-Life Movement for defending the lives of the unborn. He said they bear witness through their work that “those who have been conceived are children of the whole of society”. Pope Francis said protecting life is not a one-off action but means protecting every aspect of a person’s life. The Pope said every person should be involved in defending life at every level of society, carried out “in a multiplicity of actions, attentions, and initiatives”. Life, said the Holy Father, is a gift from God for which we cannot take sole credit. “When life itself is violated at its emergence, what remains is no longer the grateful and enchanted welcome of a gift, but a cold calculation of what we have and what we can use. Then even life is reduced to a one-time-use consumer good”. But, Pope Francis said, Italy’s Pro-Life Movement draws on the Catholic faith and Church teachings to contrast these tendencies. “May the Day for Life bring a breath of fresh air and help all to work generously” to promote life. 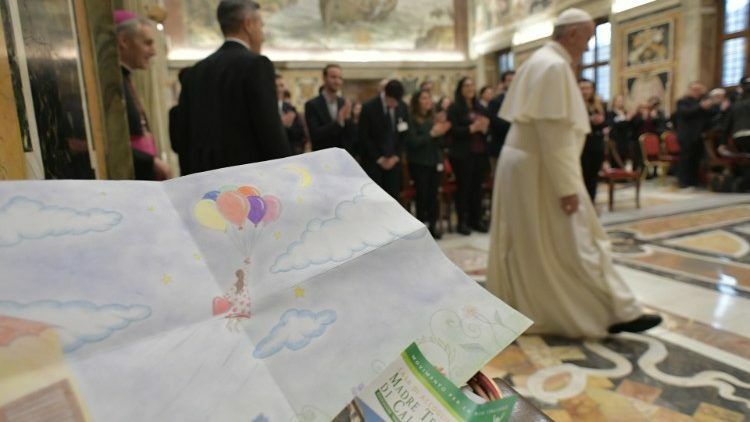 “Where there is life, there is hope!” the Pope declared. The Abortion Party will spin this as the Pope supporting the minimum wage and more foodstamps. If I may, in all humility, make a suggestion to the Holy Father to deal with the physical child abuse of abortion that leads to the child's death, the Holy Father could suggest to politicians everywhere, i.e. Gov. Cuomo, that they join with the Church in rectifying the enablement of any type of child abuse, physical, abortion, sexual and other wise and repent of any past acts of omission and commission when it comes to the protection of children and offering them legal protection from the moment of conception. He could, of course, tell bishops the place an interdict against all Catholic politicians that vote for child abuse as it concerns abortion. The Bishop of Spokane has invoked canon 915. Fr. Mac @ 10:19...How about if the just "Repent and believe the Gospel." As of now, they are, by definition, heathens. Deo gratias for Holy Mother Church's holy and tremendous Culture of Life defender and promoter, His Holiness, Pope Francis. Pope Francis has for years served as the world's most prominent pro-life advocate. He has been powerful beyond description in his defense and promotion of the Culture of Life. May the Holy People of God continue to pray for and rally around holy, God-fearing Pope Francis — our great protector of human life. May the Blessed Virgin Mary's powerful intercession keep Satan from Pope Francis.